Adjunct crisis in higher ed: An all too familiar story for black faculty. Students at Columbia University listen to Mark Rudd, chairman of SDS Columbia, speak in New York City on May 1, 1968. The New York Times reported recently on an adjunct instructor, James Hoff, who walks like a professor, talks like a professor, and teaches like a professor, but has none of the benefits of being a professor, because he is an adjunct. Adjunct labor in higher education has revealed the structural flaw in our post-recession reality: The prescription for poverty—educational attainment—has become a condition for poverty. The high price, in dollars and opportunity costs, of getting All the Education™ has to be reconfigured, because tenured jobs with their tenured wages are declining. And that has made lots of people angry. But to be clear, there’s been a labor crisis in higher ed for a long time. It just hasn’t always been a crisis for everyone in higher ed. You have two sets of conditions unfolding against these statistics. On the one hand, African-Americans are less likely to attend graduate school than whites for myriad reasons. First, you have to know that graduate school exists and is a practical option for someone like you. That often takes sharing a network—family, friends, mentors—who can model how that’s done and what it looks like. But historical discrimination in college enrollment and persisting inequalities from kindergarten through college means black students are less likely to know someone who has been to graduate school. Should you discover graduate school and meet the institutional requirements for graduate school, you still have to pay for graduate school. Everything from shelling out a couple hundred dollars per application to funding a move to get there would be a whole lot easier with inherited wealth or parents with home equity and a good credit score. Again, for reasons well-documented by sociologists like James Shapiro, the hidden cost of being black in America makes getting there a lot harder. On the other hand, there is also a set of social conditions—or what sociologists call structure—at play. The structural fissures in higher education labor are now becoming more visible to all sectors of the higher education labor market. Tenure isn’t just about managing labor costs. Tenure is and always has been political. For minorities, particularly African-Americans, tenure and academic labor have long looked like managing bottom lines and keeping the upper echelons of the Ivory Tower white and male. That “long-term fiscal crisis” the AAUP cites? It came first for all the places black folks gather in groups of two or more. The Journal of Blacks in Higher Education predicts it will come first and stay longest for black faculty, who are often last hired, first fired. Departments with a lot of black faculty are “more likely have to surrender faculty slots,” JBHE warns. That’s a prediction in line with history. Black faculty and the departments where they are found in the greatest numbers have been the most vulnerable since their inception. When the AAUP was issuing its first report on adjunct professors in the early 1980s, black students and faculty had been protesting the ghettofication of black scholars in adjunct roles for almost 20 years. In 1968, black students took over an administration building at Columbia; among their demands was a call for more tenured black faculty. 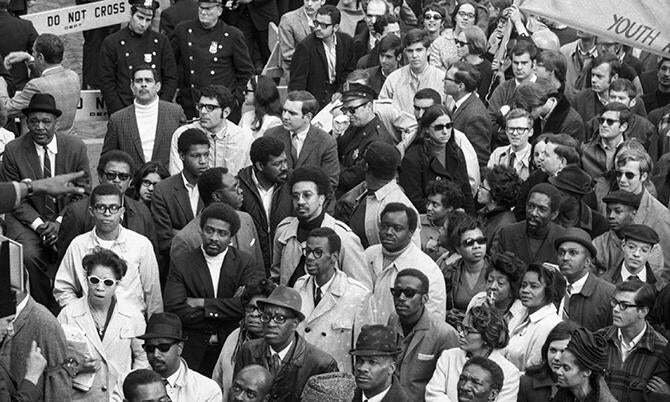 In 1969, the Black Student Union at San Francisco State University drafted a document justifying the establishment of an African-American Studies department. James Karabel’s excellent history of admissions at Ivy League universities includes correspondence among the presidents of Yale, Harvard, and Princeton as student protests spread throughout the country in the ’60s. They were more than a little terrified by the unrest. Their elegant solution was the careful recruitment of black students and black faculty within reason, so as not to disturb the universities’ culture or labor structure. It was a popular strategy. Accounts abound from minority faculty who were hired to assuage demand for diversity only to find rules for tenure and promotion that effectively trapped them in nontenure-track roles. Last year, I moderated a panel on black academic women’s health in the academy. The administrators were overwhelmed by the intensity of response. Hundreds of essays poured in about the racism and sexism that stymied their academic careers. Many felt silenced by faculty groups that were supposed to protect them, ignored by comrades in the adjunct struggle who did not address how racism compounded its effects, and exhausted from straddling so many worlds. Problems like these have been so systemic that some disciplines, such as the American Anthropological Association, have produced white papers (no pun intended) on racism, tenure, and hiring. I agree with the AAUP that the racial disparities in adjuncting are disturbing, just as I agree with the JBHE that it is systemic and historical. Our current anger about class divides in higher education labor cannot be separated from its racist roots. Or, rather, it can—but then it is about something altogether different.